It's at this time of the year that I completely re-think my skincare. Post-winter and pre-summer (fingers crossed) my skin just doesn't seem to know what to do with itself; it's a bit patchy, a little dry and a touch greasy in the T-zone and my usual moisturiser just doesn't cut it anymore. It's too rich, creamy textured and feels like it's smothering my skin with hydration when, now Spring is here and the weather's a little bit warmer, it's not needed so much. 1. 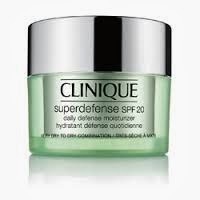 It provides full spectrum UVA/UVB protection, as well as an SPF20. I've used an SPF on my skin for years. I'm sure my complexion is relatively line and pigmentation-free because of it. 2. It minimises the appearance of UV damage (that's age spots, fine lines and irritation) you've already got with enzymes called photosomes. 3. It's more moisturising than its predecessor due to a blend of barley and wheat germ, barrier-building ingredients that hydrate and strengthen but not overwhelmingly so. 4. It feels amazing. Anti-irritants like sea whip extract (taken from a coral renowned for it's anti-inflammatory properties) and caffeine instantly soothe and the whipped-up texture is just right; not too heavy or too light. 5. The original is an award winner. You know all those beauty awards magazines spend months putting together and testing products for? The original version of this has won a ton of them. Expect this improved version to do the same. 6. It's so easy. So usually, I use a moisturiser, then a tinted one with SPF over the top or a bit of foundation. And I might have to spend a few minutes applying a bit more on drier areas or massaging it in a little. This isn't easy when you have an eight month old and a four year old waiting for milk/trains/Ben 10 dvd's. With this, I simply apply it and go. See. You can buy this online at www.clinique.co.uk.